Are you aware that the ratio of the usage of computer to mobile phone is 1:4? So, a company cannot afford to miss out on the probable interaction with potential customers using the preferred media. In this way, the company can increase their target audience by interacting with both potential as well as existing customers. One simply cannot ignore covering the mobile internet market because more and more people are turning to mobile phones due to the advanced technology. In addition to mobile phones, other multimedia devices are showcasing an upward trend when it comes to global sales. Recent statistics show that millions of people access the web using their mobile phones. Our services include mobile website designing & development to assist you in this scenario. We ensure that you are present on the more accepted mobile platform prominently. 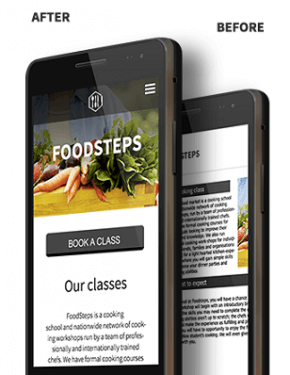 For this, it is important to have a user friendly mobile website which readily loads on mobile phones and other mobile devices. It requires lot of effort for designing such a website. But, you need not worry about that and leave it to us. One thing that is to be take care of is to make the mobile website easier to browse for the mobile phone users. It takes time to view the desktop version type of website on a mobile, so, only the most important information should be highlighted in the mobile version. One should keep an eye on the different gadgets while creating a mobile phone website, what with the advent of smart phones like the Apple Iphone and digital tablets like the Apple Ipad and such other gadgets. Since these devices are fast gaining popularity nowadays. So, one should think from their perspective as well; how the website will appear on these devices. This is one aspect that should not be ignored from the business point of view. Otherwise, the websites may not be very cohesive or user friendly on mobile phones. This will result in customers being discouraged from visiting your website. Ginger Domain can help you to avoid such a situation.